I recently received a box full of goodies, sent via Influenster. 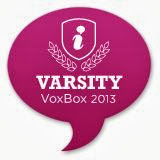 This time around, I received the Varsity VoxBox. And it is chock-full of dorm-life essentials. "Work Hard. Play Hard. No one does it like you. Your course load is full and your pockets are light, but you're still livin' the dream. 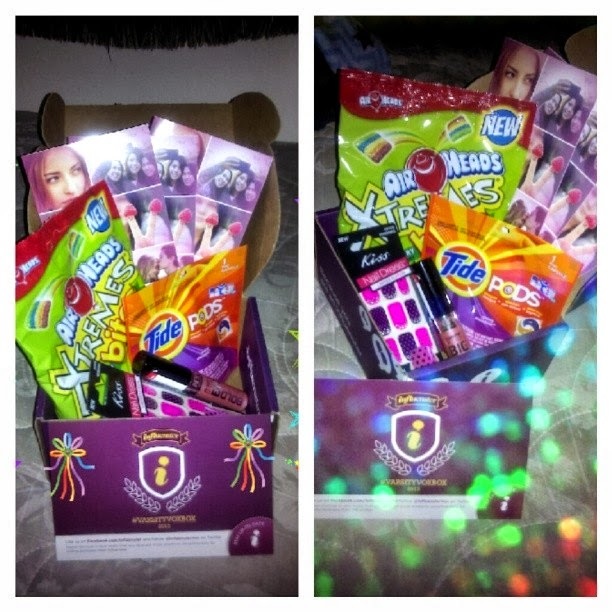 This varsity VoxBox is for the sleepless nights spent studying, partying and making memories to last a life time..."
The box came with 5 products suited to make college life a little easier. 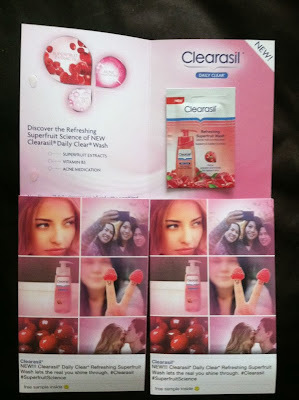 The first is 3 small foil samples of Clearasil Daily Clear Refreshing Superfruit Wash. This is perfect for the days you'd rather be wrapped up in your cocoon of blankets instead of get ready for your classes, and need a little burst of energy. It smells ah-mazing. The perfect product for some AM invigoration. Also, it is formulated with a blend of Superfruit Extracts, Vitamin B3 and blemish prevention for radiant skin day after day. It retails for $6.49 (currently only available in-store at Walmart). 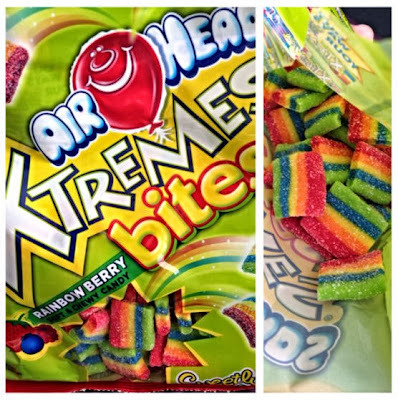 The next item was the new Airheads Xtremes Bites. Now, I detest anything sour/bitter. So I had my fiance taste test these Rainbowberry bites for me. He loves Airheads so I figured he'd be the perfect guinea pig. He says they are super sour (which he loves) and once you bite into the candies, you can REALLY taste the flavors. So I suppose "Xtremes" is quite fitting for these little buggers. These candies are great for an energy boost at 3pm or anytime you feel like snacking. Why not share with a friend and watch their reaction? I bet their face scruches up, ha ha. They retail at $1.69 (find where to buy HERE). 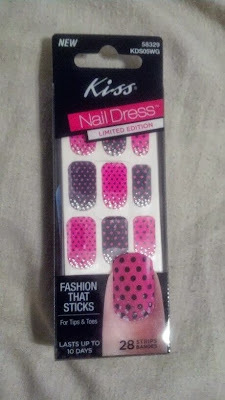 The third item included were the Kiss Nail Dress nail stickers. These work for those last minute parties that inevitably pop up as A) they take, literally, minutes to apply B) can be used as both a mani AND a pedi and C) come in a variety of shades to suit any occasion. Now, you don't have to arrive at that party, nails bare. Kiss claims that they'll last a week. CHIP FREE, mind you. And that the stickers will come right off with no remover needed. I'll be testing these to see if those two claims are correct, and have a corresponding in-depth review for you soon. Kiss Nail Dress are available at Walgreens and retail for $6.99 (buy). 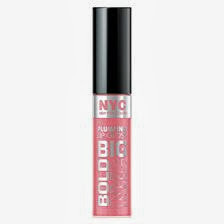 Next item is NYC New York Color's new Big Bold Plumping & Shine Gloss. NYC claims that it adds up to 50% more volume to the lips and four hours of shine for lasting wear. This product is great for adding a lovely shine to the lips whether you wear it to class or a party. I received the color Pleasantly Plump Pink. It retails for $3.99 (find where to buy HERE). The last item that came in the box was a single Tide Pod. It is the only 3-in-1 detergent. Meaning, it contains 1) detergent 2) stain fighter and 3) brightener all in one pac. I personally love this because it has an EXTREMELY small chance of making a mess. Unlike its counterparts, there is no cap and no spillage. What is also great about the Tide Pods is that they can be used to clean any size load, in any washing machine, and dissolved in any temperature. So there's no guesswork. Laundry day just became THAT much less of a chore (find where to buy HERE). Again, each of these products is destined to make days during school so much easier. I'm looking forward to using the Tide Pods and the Kiss Nail Dress the most. But who knows if the other products will end up surprising me and winning me over!